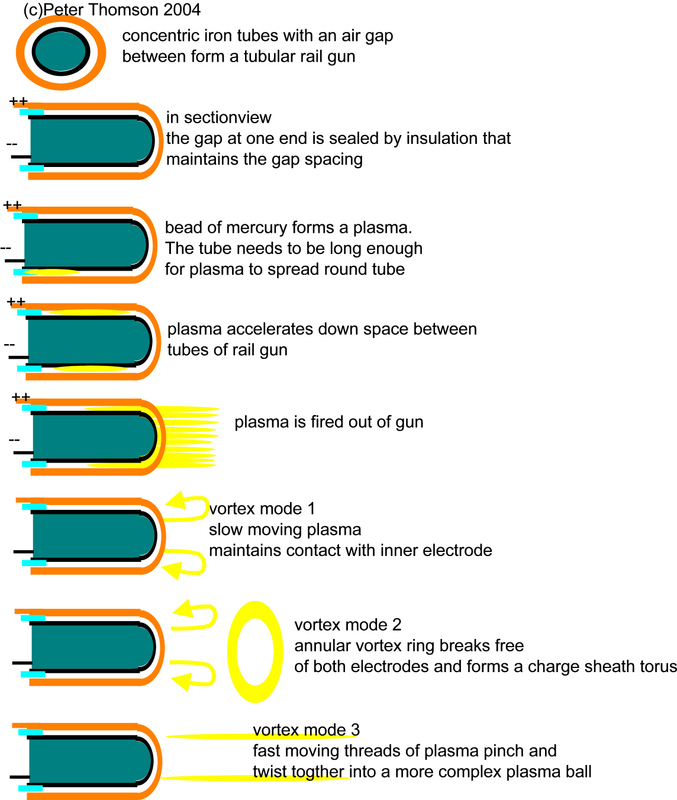 Charge Sheath Vortex - Plasma Production Modes . 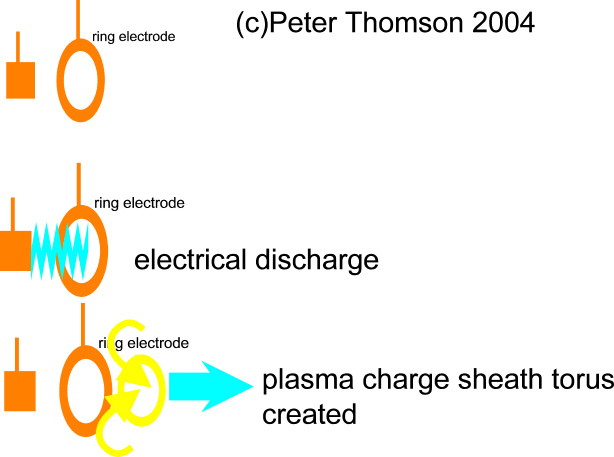 The charge sheath vortex develops within a large charge cloud where the repulsion between the charges is cancelled out, two stationary particles of the same electrical charge will repel each other, BUT two particles of the same electrical charge moving in parallel will develop a force ofattraction. 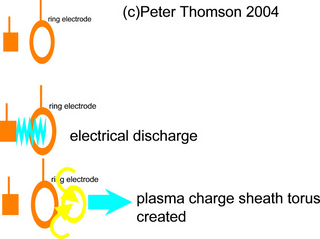 These diagrams show structures within such an external charge field that will cancel the repulsion between charge particles. 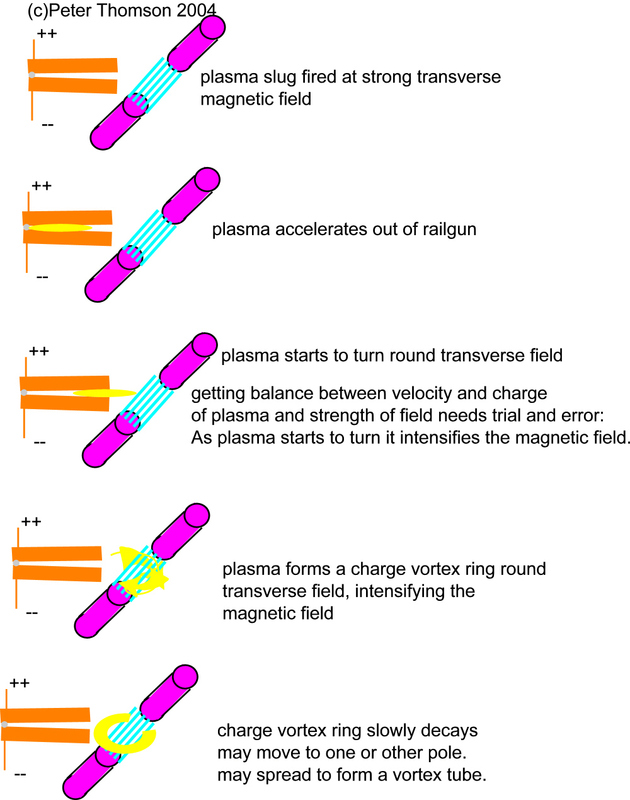 The problem with calculating the current and velocity and external magnetic field needed to produce a specific size and shape of charge sheath vortex is that the plasma has a very strong interaction with external magnetic fields, and the moving plasma also generates its own magnetic fields. As the plasma starts to move in response to the external field, it also produces its own intense magnetic field that now modifies the movement. 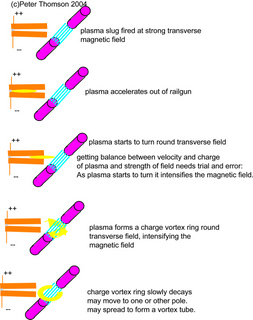 Three images of plasma regimes (with the gun electrode on the right) show a stable column (a), a kinked column (b), and a detached plasma (c). Interframe time is 1.5 µs. 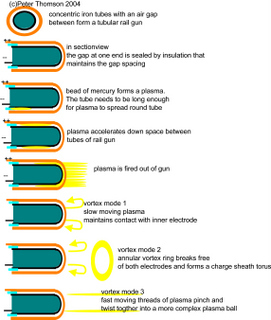 The rail gun provides a means of accelerating a plasma into a target magnetic field. The tubular rail gun provides a much more controllable environment for examining the production of the charge sheath torus. There is still a complex interraction between the plasma velocity, charge density, external magnetic fields and the formation of the charge sheathtorus.